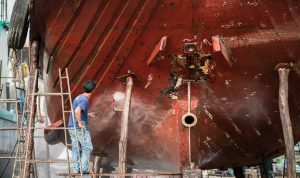 Marine Paint and Cleaning with High Pressure Water in Panama is what your boat needs to prevent rust and corrosion characteristics of the marine environment. We are specialists in high-pressure and ultra-high pressure water jetting for industrial and marine surface cleaning and preparation. We are continuously developing our technical and process capabilities to safely deliver the high-quality results our customers demand. We bring unparalleled expertise and a wide range of plant to tackle the most demanding tasks. 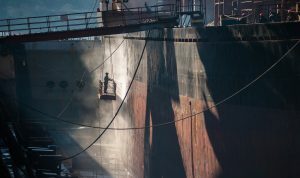 Water blasting equipment provides fast and effective removal of deposits from most areas, including cargo holds, top-side tanks, decks, hatch covers, ballast tanks and pipes. 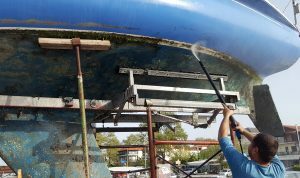 Water blasting is the best method to prepare your surface for maintenance: in contrast, hammering and pneumatic tools damage the steel profile and knock salt further into the steel, while dry blasting creates hazardous air quality and disrupt other activities and creates large quantities of waste material.